The outer side of the upper leaf has a wind rose with 32 directions, eight of which are named. There is a sun face coloured in red at the centre, a compass viewing hole and brass index arm, and coloured decoration of leaves and arabesques in the spandrels. The inner part of the upper leaf has a pin gnomon dial (pin missing) for Italian hours numbered in red from 13 to 24 and, inscribed in a kind of globe, holes for adjusting the string gnomon dial to the latitudes 42?, 48?, 54?. Below, a string gnomon dial indicates common hours numbered from VI to XII to VI with dots and lines for the half and quarter hours. The inner part of the lower leaf has a compass with the cardinal points marked (glass, needle and ring missing), the cardinal points named 'S', 'ORIENS', 'M', 'OCCIDENS', and the maker's mark, a crowned serpent (very faded). 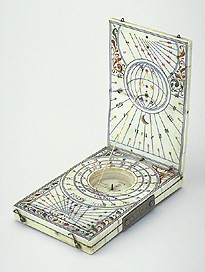 The compass is enclosed in a string gnomon dial with common hours numbered from 4 to 12 to 8, IIII to XII to VIII and 4 to 12 to 8 for the latitudes mentioned above indicated by the inscription 'POLVS HEG'. Below is a pin gnomon dial (pin missing) indicating Italian hours numbered in red from 10 to 23 and Babylonian hours numbered in black from 1 to 14. At the bottom is the inscription 'GRO VNT KLAN VR' ('large and small hours'), which appears to be incorrect since both systems of hours would have been defined as 'large'. On the borders is an arabesque decoration. The outer side of the lower leaf has a lunar volvelle with a table of epacts ('incorrect', i.e. it starts with 17 / 7 and has the terms 'Julian' and 'Gregorian' reversed) and a motif of coloured flowers and leaves on its top and bottom. There are also three bun feet. On the left edge of the lower leaf is a compartment for the wind vane (missing) and on the right edge, a plate with the maker's mark and initials.